Do you recall the heavenly aroma of Cinnabon that lingers throughout the shopping mall? I rarely go to the mall because it’s kinda dreadful and claustrophobic for me, but the smell of Cinnabon is not forgotten. Honestly, it smelled like Cinnabon in my house yesterday when I made these cinnamon roll squash muffins. Luckily, these are a million times better than one of those puppies sold in the mall. Yes, it is still a treat (a fall-inspired one in this case), but it’s better than the alternative and homemade with real ingredients too! To be honest, I’ve never actually had anything from Cinnabon in my life — well, maybe a cookie (a very long time ago), but never any cinnamon rolls. The cinnamon roll topping brings these squash muffins to life. I’m sure they’d taste wonderful on their own, but cinnamon topping and pecans? Yes, please! Not to toot my own horn here, but these muffins are straight-up wonderful (okay, maybe I’m tooting my own horn a little). The addition of the butternut squash puree makes them incredibly moist. Combine all ingredients together in a small bowl. 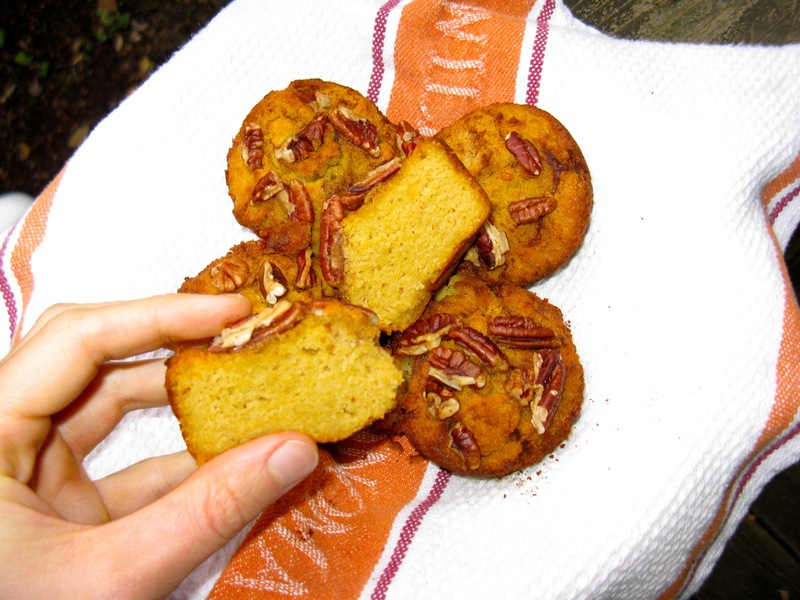 Combine all ingredients together — except pecans–in the food processor and process until a smooth, fluffy batter forms. Alternatively, you can mix all the dry ingredients together, whisk the wet ingredients together in a separate bowl, and then whisk the wet ingredients into the dry. 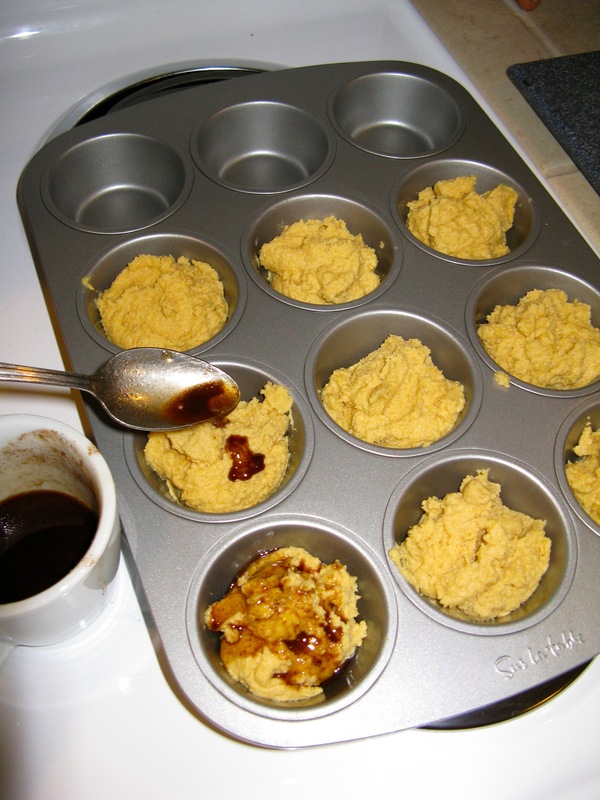 Grease muffin cups or line with parchment paper liners. Fill each with approximately 1/4 cup of batter. 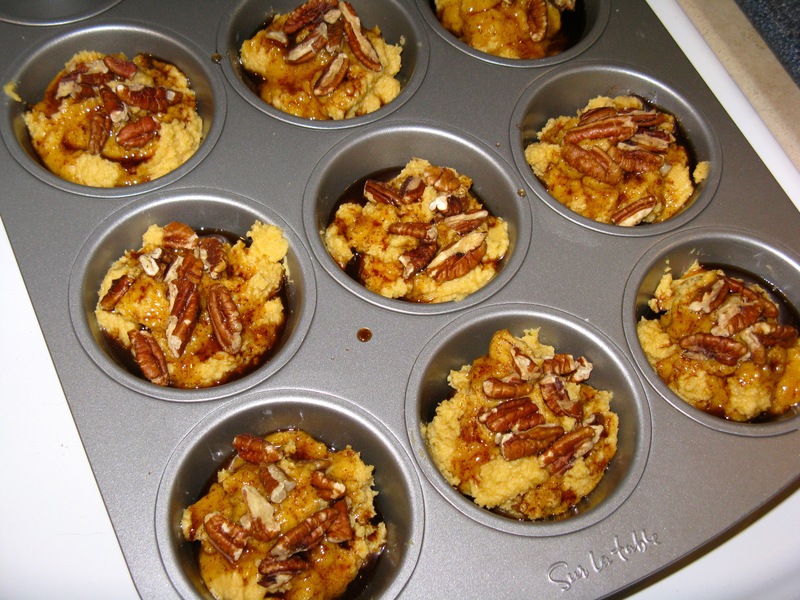 Spoon cinnamon mixture over each muffin and top with pecans, if using. Bake at 350 degrees F for 20-25 minutes or until a toothpick inserted in the center of the muffins comes out clean. Few questions, do you think you could sub pumpkin puree for the butternut squash puree and also what about using almond flour in place of coconut flour? Only because I have these on hand now so I was just wondering…. I’ve never had cinnabon either, but am a huge cinnamon fan as well! 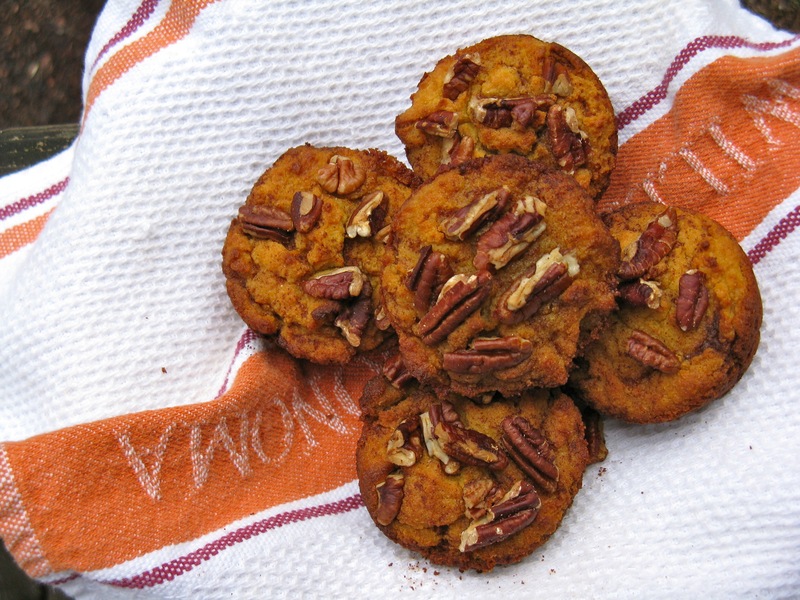 Yes, you could definitely sub pumpkin puree in place of the squash and yes on the almond flour as well. You’d need to use more almond flour though. Coconut flour is dense, so you use less. You may have to experiment with it but you’ll probably need 1 to 1-1/2 cups of almond flour. Hey I’m actually in the process of making them now! I couldn’t wait haha. I’m going by your recipe just in case I use almond flour and it doesn’t turn out! Thanks hahah I couldn’t resist! Just sent you another reply. What temp are these to be cooked at? Oops I’m so silly I see now that you say 350! I totally just read over that part! That’s because I just added it in! I totally spaced on mentioning it, so thank you for pointing it out! Lol that’s so funny! I thought I’d gone a bit mad haha! Lemons ‘n Lyme, these are unbelievable! I can’t wait for you to try them. They literally knocked my socks off! Just made these! Very delicioussss, once I tasted the batter I didn’t think they were going to make them into the oven. One thing… my batter was really dry so when I cooked them the center didn’t get completely cooked (that didn’t stop the devouring though 🙂 ). Didn’t know if your was that way or not? Huh, that’s strange. No, I didn’t have that problem. Mine were super moist and cooked all the way through and my batter was moist and fluffy. I’m not sure what happened with your batter, but I’m glad they still tasted good! If you make them again and the batter turns out dry, you can maybe try adding a little extra squash puree or a touch of water for moistness. Yeah, I was thinking about doing that (figured I should) but I didn’t want to alter the recipe any since yours came out so perfectly. Well, I’m definitely making these again so I’ll see what happens! Oh wow, I forgot to put that in there! 350 degrees F. I will correct that on the post. My bad! Sounds perfect! I’m so glad you like them and thanks for testing them out so quickly! Haha, we might be able to work out a deal, Megan 😉 You know you can make your own coconut or almond flour at home, right? It’s really easy. The great thing about coconut flour is that a little goes a long way (b/c it’s dense), so it lasts a long time (at least it does for me). You are right, even the raw batter tastes fantastic. I liked the bowl clean! Oh, that’s good to know! I’ll have to try it that way. I usually nuke mine in the microwave for several seconds. Next time I’ll try it cold 😉 Thanks for letting me know! I’m allergic to coconut and had to use almond flour. If some reason you use almond flour double the amount of flour use… they were runny and not thick like your picture until I added more. Yes, coconut and almond flour are very different. Coconut flour is extremely dense, so you always use less. With almond flour, you’d need at least 1 cup, if not a bit more for this recipe. I’m glad you figured it out though and that they tasted delicious with almond flour! Awesome that you’ve already made them twice too! Thanks for sharing your modifications! They look like heaven in a muffin. That’s a pretty accurate description! These look SO good. I don’t have honey though…hmm…I eat so much sugar in fruit (I’m not paleo by the way…but ought to be), but I always thought honey = sugar added = unnecessary. Maybe I’m limiting myself. Honey is the only sweetener I use (and can use). I always try and opt for very small amounts, even if something calls for more and especially if there’s fruit in it. I’m so glad you like my recipes, but sorry to hear you don’t have access to much. That’s how it is when I visit my family back in Michigan (I’m from a really small town). Where are you from, Jill? I know it’s not the most convenient thing, but there are lots of great resources for getting things (i.e. grass-fed meats) online. It can be pricey, but it’s nice if you go in on an order with someone. I live in rural Canada. Not much here. I’ve heard of online stuff, but that would break my bank 🙂 So expensive to eat well…I know people says its not, but it really is. Like low-carb folks say its not expensive, but their buying the “crap”” meats, etc…in order to buy stuff without all the junk in it, its expensive. Even eggs…for me to buy organic eggs it would be 6.99, the “antibiotic free” ones are 4.49 and the regular ole ones range from 2-3 bucks…I go with the middle one, but thats sstill STEEP…jeesh. I see. Yes, rural areas make it very challenging, but you gotta do the best that you can with what you’ve got, without going broke! I agree that it is more expensive, but my partner and I prioritize and make room for it in our budget, though it’s not always easy. We watch for sales, especially on grass-fed meats and do the best we can. The pastured eggs we buy are a bit spendy too ($5.99/dozen), but they taste and look so much better than just the free range, certified humane eggs. Hey Elissa, thanks! The muffins are super good, and I hope you enjoy them as much as I did. Thanks for sharing the link to your breakfast post! It looks delicious — almost like dessert! Hi. Found this recipe via a friend. I don’t follow a paleo diet and was wondering if I could sub white whole wheat for the coconut flour? I saw you said coconut flour was dense, but ive never worked with it so not sure how dense it is compared to wheat flours. Can’t use the other flours bc of allergies in the family. Thanks. They look delish! You can, but it’s not an equal substitution. You’ll end up using more wheat flour because it’s much less dense than the coconut (coconut is VERY dense). I don’t know exactly how much to tell you to use, but it’ll probably be at least double that of the coconut. I take it you have coconut/tree nut allergies in your family? Thanks for the quick response! I’ll experiment with the amount-thanks. Yup…I’m allergy free but not some of my boys. No problem! Good luck with the recipe. I hope it works out for you! It might take some experimentation and a couple tries to get it right. Just made these with a lot of improv and they came out amazing….so I would like to declare them foolproof! I food-processed coconut meat flakes to make my own flour but it was courser that what you probably had so I increased the amount until I liked the consistency of the batter……I ran out of honey during (I was also baking some honey-chipotle chicken for the week), so i made the topping with agave…..and I used canned pumpkin since I always have some in the house……made 11 muffins, and they are just right! I didn’t even know my muffins were foolproof, but I’m happy to hear it 😉 I’m glad everything worked out for you and it sounds like you had fun making them! It makes me happy when people try and like my recipes, so thank you! Chaperoned a field trip this weekend and needed something to snack on during the ride, made these and everyone LOVED them!! 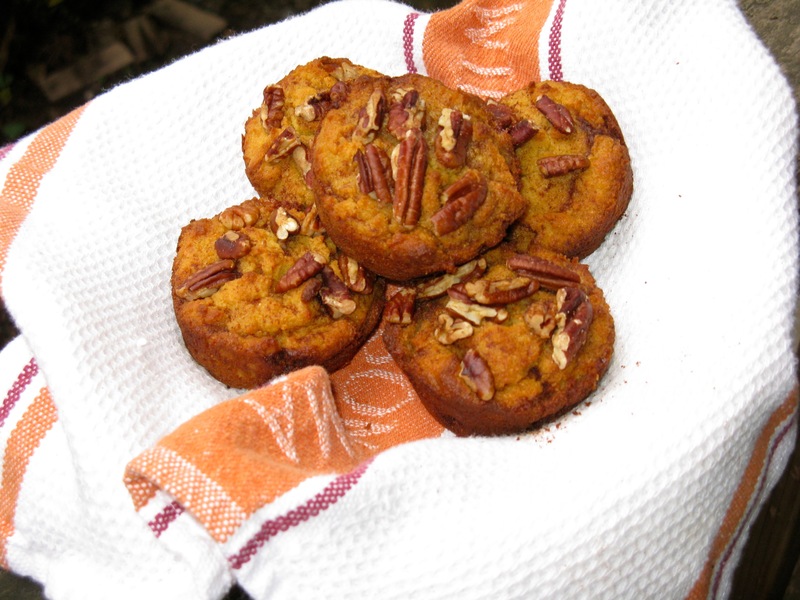 I baked a double batch of these muffins this morning using roasted golden hubbard squash. For the topping, I didn’t have pecans, so I chopped brazil nuts and mixed them right in with the butter, cinnamon, nutmeg, maple & honey mixture for a sweet, crunchy topping. They came out melt-in-your-mouth perfect after 25 minutes in the oven. I agree, this recipe is foolproof! You can double it, and/or add just about anything to suit your taste, and it comes out moist & delicious. Next time, I will add grated orange rind! Love! I’m glad you had fun with the recipe and found a way to make it work with what you had on hand. You added your own personal touches, which I love! It’s fun to get creative. Sometimes, improvisation works out in our favor 🙂 Thanks for sharing, Annie. changes…. I strongly recommend this to ANYBODY! I started the diet off by watching this youtube vid for great recipes! What brand of coconut flour are you using? Have you used any flours other than coconut or almond? I use the Coconut Secret brand of coconut flour. No, I only use coconut or almond flour when baking, but have also used almond butter or sunflower seed butter (which essentially acts as flour). As you know, I don’t eat grains, so never use grain/gluten flours and things like tapioca flour/starch and arrowroot flour don’t work for me even though they are paleo-friendly. It’s too much starch for my system and I need to be careful with stuff like that. Do you know what the calorie count is on these muffins? I’m sorry, but I don’t. You could get a rough idea by entering it into a tracker as a recipe. It takes a bit of legwork, but would give you an estimate if that’s important to you. Made these this morning. Lovely. Delicious, and I really liked the texture – nice texture sometimes hard to come by in a paleo muffin. This will go on my list of staples for a handy breakfast. I used coconut oil in the muffins, but use Shamim’s Pantry Vanilla Honey Ghee for the topping. I left them nut-free (don’t have to, but sometimes I like to go without). And I used ‘Lil Dumpling squash. Thanks! What a creative recipe!! I love this idea, will have to try for breakfasts soon! We just bought a HUGE butternut squash! Nice to meet you, fellow Portlander! love, love, love! I made these for my grandson who has some food issues. He barely eats anything nutritious seriously suffers with texture, tastes so I worry about his diet These are full of nutrition and he loves them as well. I am working to find ways to hide good nutrition in a kid friendly muffin or cookie. Thanks for the help. Forgot to mention … I used pumpkin pie spice for the topping. It really is delicious! Great idea with the pumpkin pie spice! I’m so happy to hear your grandson is able to eat these and enjoys them too. That makes me smile 🙂 Thank you for sharing, Judi. This recipe works! Tried it tonight and my husband looooooved every bite. I didn’t make the topping not because it didnt look good just because we are keeping the sugars down. They backed up beautifully. I needed a few extra minutes and only used 1 tbs of maple syrup and they were still outstanding. Wonderful, Nicole! I’m so glad you and your husband enjoyed the muffins! Thanks for trying the recipe and taking the time to comment!